Direct methods based on 1H NMR spectroscopic techniques have been developed for the determination of neutral lipids (triglycerides and free fatty acids) and polar lipids (glyceroglycolipids/phospholipids) in the solvent extracts of oleaginous microalgal biomasses cultivated on a laboratory scale with two species in different media. The chemical shift assignments observed in the 1H and 13C NMR spectra corresponding to unsaturated (C18:N, N = 1–3, C20:3, C20:5, C22:6, epoxy) and saturated (C14–C18) fatty acid ester components in a complex matrix involving overlapped resonances have been unambiguously confirmed by the application of 2D NMR spectroscopy (total correlation spectroscopy and heteronuclear single quantum coherence–total correlation spectroscopy). The study of the effect of a polar lipid matrix on the determination of neutral lipids by an internal reference blending process by a systematic designed experimental protocol has provided absolute quantification. The fatty acid composition of algal extracts was found to be similar to that of vegetable oils containing saturated (C16–C18:0) and unsaturated (C18:N, N = 1–3, C20:N, N = 3–4, C22:6) fatty acids as confirmed by NMR spectroscopy and gas chromatography–mass spectrometry analyses. 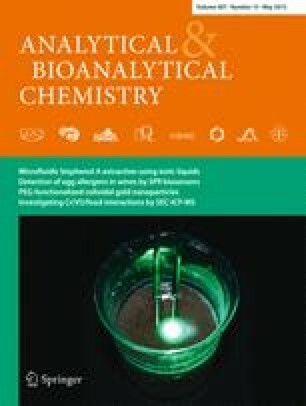 The NMR methods developed offer great potential for rapid screening of algal strains for generation of algal biomass with the desired lipid content, quality, and potential for biodiesel and value-added polyunsaturated fatty acids in view of the cost economics of the overall cost of generation of the biomass. The online version of this article (doi: 10.1007/s00216-015-8613-6) contains supplementary material, which is available to authorized users. We sincerely thank INMETRO, Brazil, for conducting this research, which is of national importance to Brazil in view of the development of fuels from sustainable resources. We are thank the Instituto Nacional de Tecnologia for collaboration in the project. We also express our thanks and gratitude to the Conselho Nacional de Desenvolvimento Científico e Tecnológico (CNPq) for the grant of a fellowship.